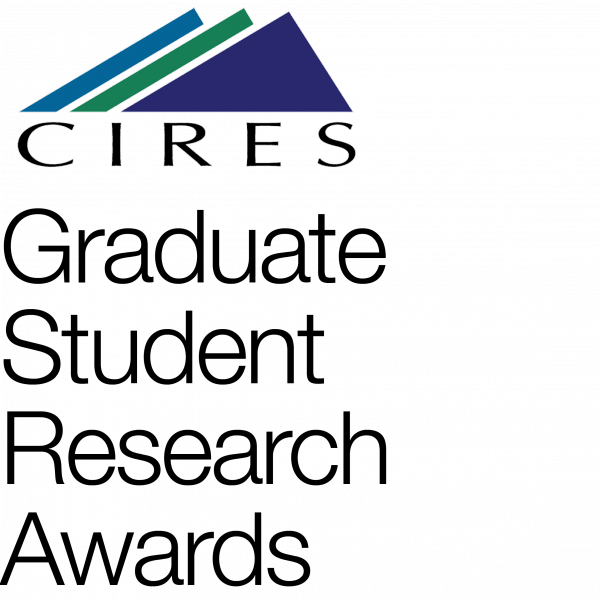 CIRES supports a Graduate Student Research Award program to promote student scholarship and research excellence. The goal of the program is to recognize the scholarship and merit of CIRES' outstanding graduate students. Any current Ph.D. student that is formally supervised by a CIRES Fellow or CIRES Researcher is eligible for this one-time award opportunity. Prospective graduate students are not eligible to apply. The 2019 competition opens February 6, 2019. Applications are due February 28, 2019. Graduate Student Research Awards support the equivalent of two semesters of funding to be spent as agreed to by the CIRES Advisor. Included in the GSRA are salary support, fully paid tuition, and a partially paid premium (90%) towards the Buff Gold Insurance Plan. Any current PhD student enrolled in a University of Colorado Boulder Graduate Program and supervised by a CIRES Fellow or CIRES Researcher is eligible to apply. Each CIRES Fellow or CIRES Researcher may select ONLY ONE student to compete for this award in a given year, so please contact your advisor to ensure you have his/her support before submitting your application. Previous GSRA (formerly the Graduate Student Fellowship) recipients are not eligible to apply. Exceptional achievement in graduate career at CIRES including awards, publications, and grades. Engagement with and commitment to CIRES. The proposal should be innovative, feasible, and student-led. It should also be clear and concise. Congrats to our 2019 CIRES Graduate Research Award recipients! Angela Oliverio (Noah Fierer). Topic: Predicting the distribution and ecological functions of protists in soils from across the globe. Tobin Hammer (Noah Fierer, CIRES Fellow, Ecology and Evolutionary Biology). Topic: The role of gut bacteria in passion-vine butterfly pollination. Jake Flood (Shelley Copley, CIRES Fellow, Molecular, Cellular and Developmental Biology). Topic: How do microbes tolerate the stresses involved in the degradation of pentachlorophenol (PCP)? Vineel Yettella (Jennifer Kay, CIRES Fellow, Atmospheric and Oceanic Sciences). Topic: Warming influence on ENSO: new insights from a novel decomposition method. Erin McDuffie (Stephen Brown, NOAA). Topic: The Role of Heterogeneous Chemistry in Understanding Wintertime Air Pollution. John Berggren (Lisa Dilling, Western Water Assessment) Topic: Transitioning to a new era in Western United States water governance: Examining adaptive capacity and equitable water policy in the Colorado River Basin. Ryan Davis (Margaret Tolbert, Chemistry and Biochemistry) Topic: Laboratory studies of contact efflorescence involving organic and mixed organic-inorganic aqueous aerosols. Natalie Kille (Rainer Volkamer, Chemistry and Biochemistry) Title: Developing the mobile Solar Occultation Flux technique to quantify emission fluxes of trace gases. Jenny Nakai (Anne Sheehan, Geological Sciences) Topic: Tectonic and anthropogenic causes of small magnitude earthquakes in Colorado and New Mexico. Rebecca Rapf (Veronica Vaida, Chemistry and Biochemistry) Title: Building molecular complexity via aqueous photochemistry in ancient and modern environments. Tasha Snow (Waleed Abdalati, Geography) Title: Evaluating fjord sea surface temperature influences on Greenland outlet glacier variability . Cao Chen (Xinzhao Chu group, Aerospace Engineering Sciences) Topic: Exploration of the Mystery of Polar Wave Dynamics with Lidar, Radar and High-Resolution General Circulation Model. Zachary Finewax (Joost de Gouw, Department of Chemistry and Biochemistry) Topic: Investigating Aerosol and VOC Products of Biomass Burning Emissions Through HR-CIMS and Thermal Desorption Particle Beam Mass Spectrometry (TD-PBMS). Harrison Gray (Dr. Gregory Tucker group, Geological Sciences) Topic: Development and application of luminescence dating as a new means to estimate sediment transport rates. Catalin Negrea (Tim Fuller-Rowell, Electrical, Computer and Energy Engineering) Topic: Ionospheric Physics. Stephanie Redfern (Jen Kay group, Department of Atmospheric and Oceanic Sciences) Topic: Global/Regional Climate Modeling & Climate Science Communication. Samantha Thompson (Jose Luis Jimenez group, Department of Chemistry) Topic: Characterization and Deployment of a soft ionization mass spectrometer for organic aerosol and gas detection. Shuichi Ushijima (Margaret Tolbert group, Department of Analytical Chemistry) Topic: Heterogeneous efflorescence of atmospherically relevant salts by mineral dust particles. Fnu Yanto (Balaji Rajagopalan group, Civil Environmental and Architectural Engineering) Topic: Space-Time Variability of Indonesian Hydroclimate: Diagnostics, Modeling and Implications for Water Resources Management. Jonathon Leff (Dr. Noah Fierer group, Ecology and Evolutionary Biology Department). Topic: Effects of elevated nutrient inputs on soil microbial community structure and function in global grasslands. Eleanor Waxman (Dr. Rainer Volkamer group, Chemistry and Biochemistry Department). Topic: Secondary Organic Aerosol Formation from Glyoxal: Uptake Studies and Reactivity. Anthony Wong (Dr. David Noone group, Atmospheric and Oceanic Sciences). Topic: Land surface model calibration and parameter estimation. Daniel Zietlow (Dr. Anne Sheehan group, Geophysics). Topic: Investigating Mechanisms of Lithospheric Shortening via Ocean Bottom Seismometers: South Island, New Zealand. Emily Gill (Dr. Balaji Rajagopalan group, Civil, Environmental and Architectural Engineering). Topic: Understanding and Reconstructing Mid-Holocene South Asian Monsoon Variability over India. Abigail Koss (Dr. Joost De Gouw group, Atmospheric VOC Research). Topic: Development of a GC-CIMS Instrument for the Detection of Atmospheric Semi- and Intermediate Volatility Compounds. Jordan Krechmer (Dr. Jose Jimenez group, Chemistry and Biochemistry Department). Topic: Development and application of an NO3--IMS-TOF for in-situ analysis of highly oxidized SOA precursors. Xi Wang (Dr. Max Boykoff group, Environmental Studies Program). Topic: Renewable Energy Policy. Meaghan Daly (Dr. Lisa Dilling group, Environmental Studies Program). Topic: Examining Processes of Knowledge Co-production for Climate Adaptation in East Africa. Lucy McAllister (Dr. Max Boykoff group, Environmental Studies Program). Topic: Hiding in Plain Sight: The Role of Corporations in Electronic Waste Management. Jesse Nusbaumer (Dr. David Noone group, ATOC). Topic: The simulation of atmospheric rivers and atmospheric moisture transport in global climate models. Russell Perkins (Dr. Veronica Vaida group, Chemistry). Topic: Understanding Anthropogenic Emissions by Investigating Mixed Aromatic-Aliphatic Films On Water Surfaces. Francis Rengers (Dr. Greg Tucker group, Geological Sciences). Topic: The Role of Wildfire Disturbance on Landscape Formation. Celia Schiffman (Dr. Roger Bilham group, Geophysics). Topic: Recent earthquakes and seismic hazard in Haiti and the Himalayas. John Smith (Dr. Xinzhao Chu group, Aerospace Engineering Sciences). Topic: Whole atmosphere lidar enabling new frontiers of science for the atmosphere-space interaction. Kyle Zarzana (Dr. Maggie Tolbert group, Chemistry). Topic: Relationship Between Organic Aerosol Composition and Optical Properties. Gaddy Bergmann (Dr. Noah Fierer group, Ecology and Evolutionary Biology Department) Topic: Geographic variation in the bison gut microbiome. Sean Haney (Dr. Baylor Fox-Kemper, Oceanic and Atmospheric Sciences) Topic: Ocean boundary layer turbulence. Brett Palm (Dr. Jose Luis Jimenez, Analytical/Atmospheric Chemistry) Topic: Application of a Rapid Secondary Aerosol Formation Measurement Tool for Laboratory and Field Studies. Adriana Raudzens Bailey (Dr. David Noone, Atmospheric and Oceanic Sciences) Topic: Vertical moisture exchange through the convective boundary layer. Joe Rokicki (Dr. Shelley Copley, Molecular, Cellular, and Developmental Biology) Topic: A newly evolved regulatory pathway in Sphingobium chlorophenolicum. Jessica Weinkle (Dr. Roger Pielke Jr, Environmental Studies Program) Topic: The dissertation research is a policy evaluation of Florida's Citizens Property Insurance Corporation.